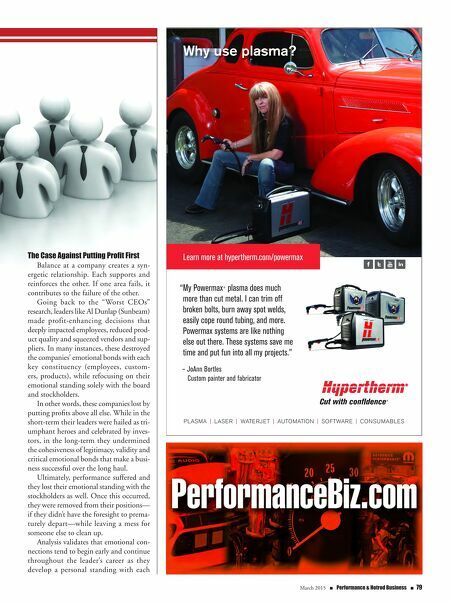 78 n Performance & Hotrod Business n March 2015 BUSINESS Balancing Act Relationships are the key to long-term success. n BE A LEADER By TimoThy F. Bednarz R esearch reveals that great leaders create emotional balance. Balance is an outcome of leaders' actions and performance, and mir- rors the overall health and sustainability of the organization. 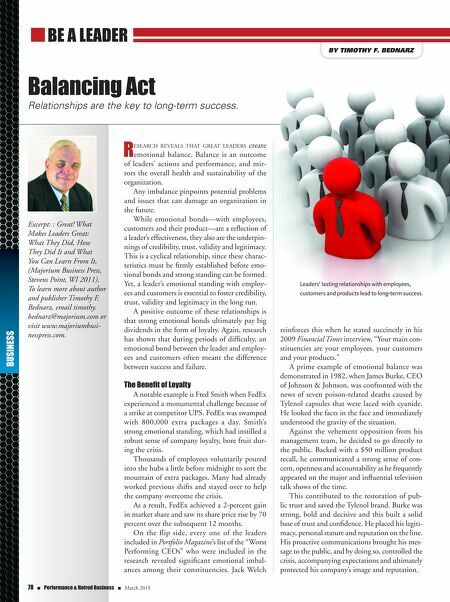 Any imbalance pinpoints potential problems and issues that can damage an organization in the future. While emotional bonds—with employees, customers and their product—are a reflection of a leader's effectiveness, they also are the underpin- nings of credibility, trust, validity and legitimacy. This is a cyclical relationship, since these charac- teristics must be firmly established before emo- tional bonds and strong standing can be formed. Yet, a leader's emotional standing with employ- ees and customers is essential to foster credibility, trust, validity and legitimacy in the long run. A positive outcome of these relationships is that strong emotional bonds ultimately pay big dividends in the form of loyalty. Again, research has shown that during periods of difficulty, an emotional bond between the leader and employ- ees and customers often meant the difference between success and failure. The Benefit of Loyalty A notable example is Fred Smith when FedEx experienced a monumental challenge because of a strike at competitor UPS. FedEx was swamped with 800,000 extra packages a day. Smith's strong emotional standing, which had instilled a robust sense of company loyalty, bore fruit dur- ing the crisis. Thousands of employees voluntarily poured into the hubs a little before midnight to sort the mountain of extra packages. Many had already worked previous shifts and stayed over to help the company overcome the crisis. As a result, FedEx achieved a 2-percent gain in market share and saw its share price rise by 70 percent over the subsequent 12 months. On the flip side, every one of the leaders included in Portfolio Magazine's list of the "Worst Performing CEOs" who were included in the research revealed significant emotional imbal- ances among their constituencies. Jack Welch reinforces this when he stated succinctly in his 2009 Financial Times interview, "Your main con- stituencies are your employees, your customers and your products." A prime example of emotional balance was demonstrated in 1982, when James Burke, CEO of Johnson & Johnson, was confronted with the news of seven poison-related deaths caused by Tylenol capsules that were laced with cyanide. He looked the facts in the face and immediately understood the gravity of the situation. Against the vehement opposition from his management team, he decided to go directly to the public. Backed with a $50 million product recall, he communicated a strong sense of con- cern, openness and accountability as he frequently appeared on the major and influential television talk shows of the time. This contributed to the restoration of pub- lic trust and saved the Tylenol brand. Burke was strong, bold and decisive and this built a solid base of trust and confidence. He placed his legiti- macy, personal stature and reputation on the line. His proactive communications brought his mes- sage to the public, and by doing so, controlled the crisis, accompanying expectations and ultimately protected his company's image and reputation. Excerpt: : Great! What Makes Leaders Great: What They Did, How They Did It and What You Can Learn From It, (Majorium Business Press, Stevens Point, WI 2011). To learn more about author and publisher Timothy F. Bednarz, email timothy. bednarz@majorium.com or visit www.majoriumbusi- nesspress.com. Leaders' lasting relationships with employees, customers and products lead to long-term success.